Could ET really have ridden a bike? An intro to exoanatomy. © ss jothiratnam. 3 Is this science fiction? Surprisingly enough, not really. 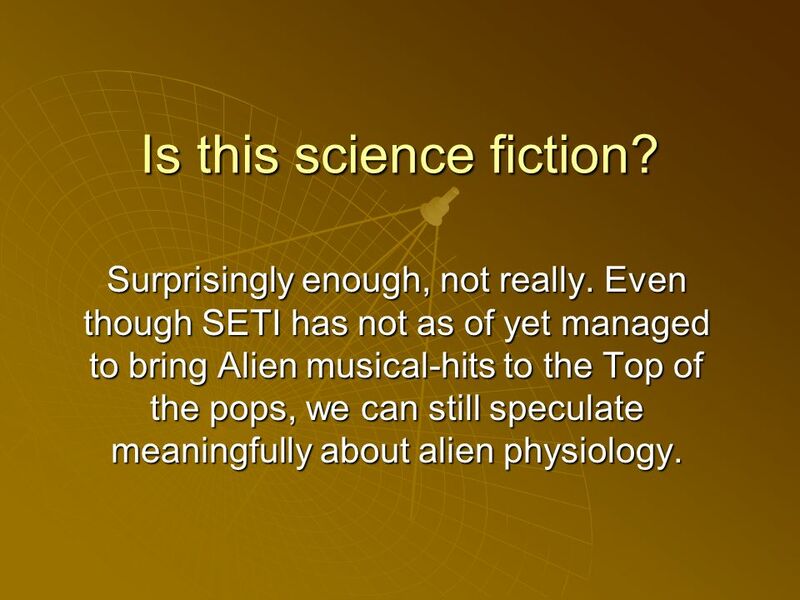 Even though SETI has not as of yet managed to bring Alien musical-hits to the Top of the pops, we can still speculate meaningfully about alien physiology. 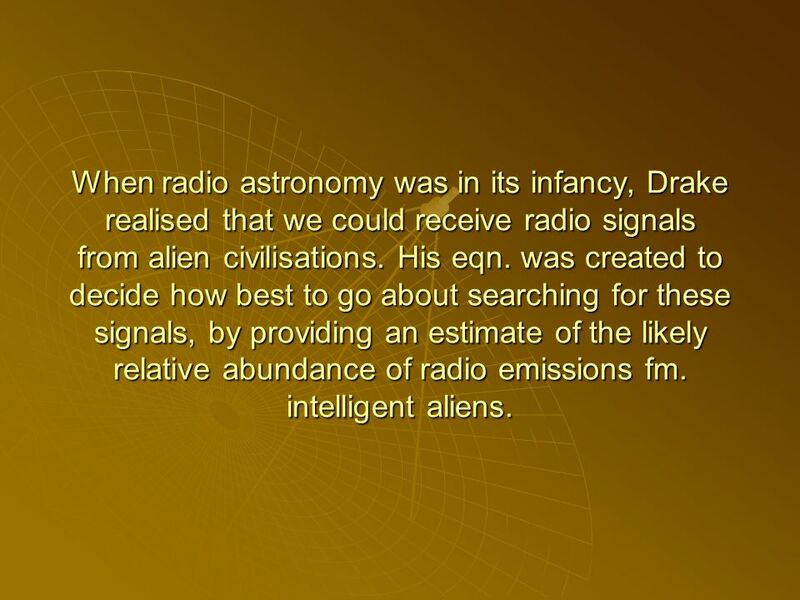 5 When radio astronomy was in its infancy, Drake realised that we could receive radio signals from alien civilisations. 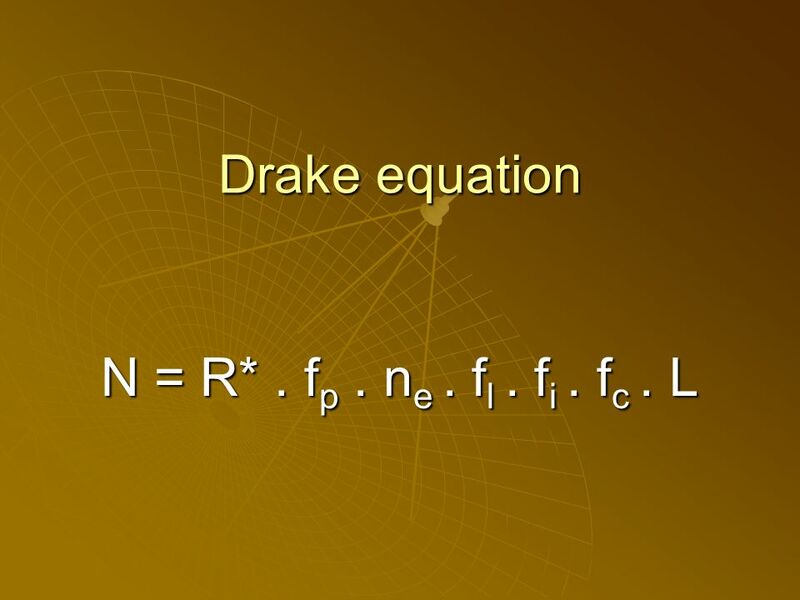 His eqn. was created to decide how best to go about searching for these signals, by providing an estimate of the likely relative abundance of radio emissions fm. intelligent aliens. 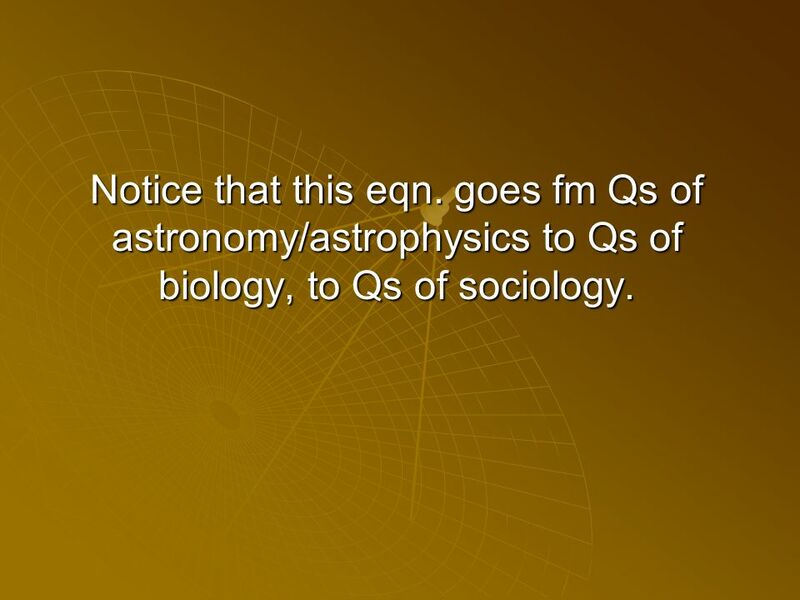 9 Notice that this eqn. goes fm Qs of astronomy/astrophysics to Qs of biology, to Qs of sociology. 10 Statistical analysis. Ca. 10 10 ~10 11 stars per galaxy Somewhere in excess of 10 10 galaxies in the known univ. 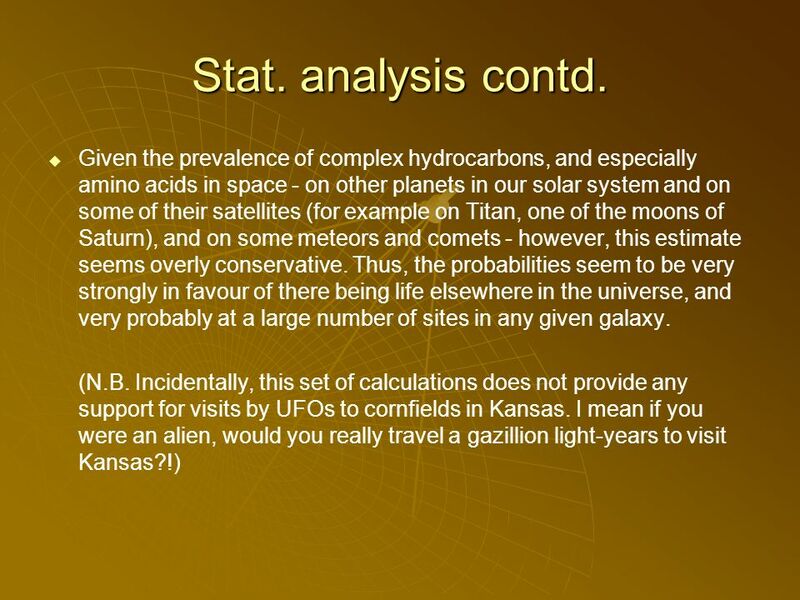 (based on density estimates) I.e. estimated 10 20 ~10 21 stars in the known universe Guess at how common planetary systems are. 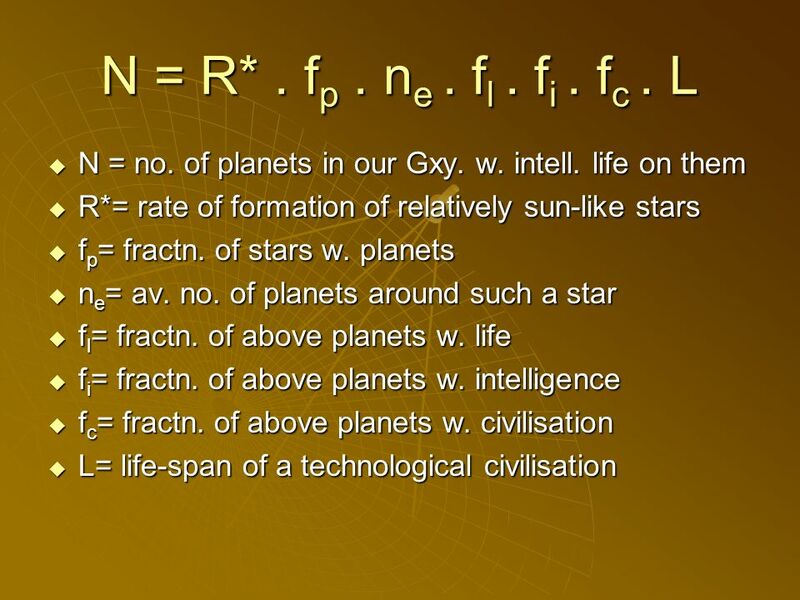 Being very conservative, guess 10 - 6 (in actuality, the frequency looks to be at least one in 10 3, if not better based on recent discoveries of extra-solar planets) Of these planets, how many have the capability of supporting life? Here, were on even thinner ice. 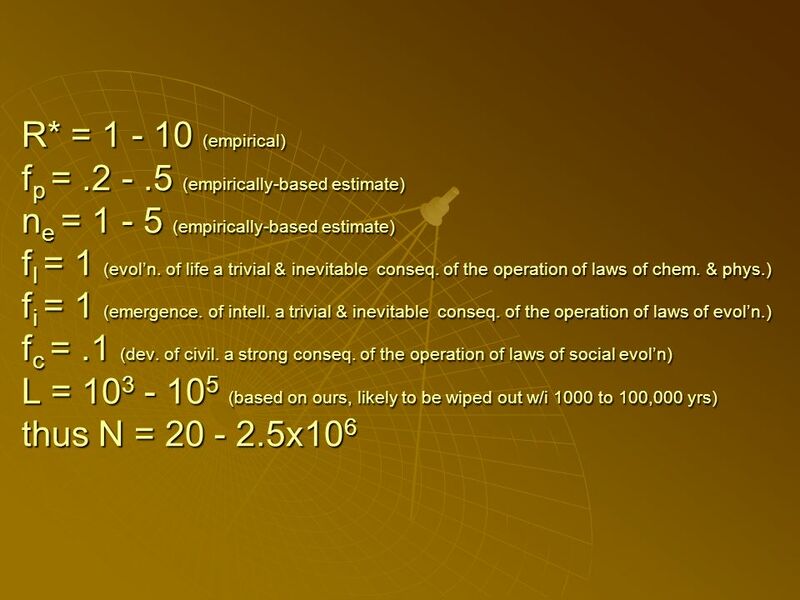 For the previous estimate, we could reasonably determine that 10 - 6 was a conservative estimate; but for the present case, we have absolutely no idea what a reasonable guess might be, all we can hope for are contingent estimates. 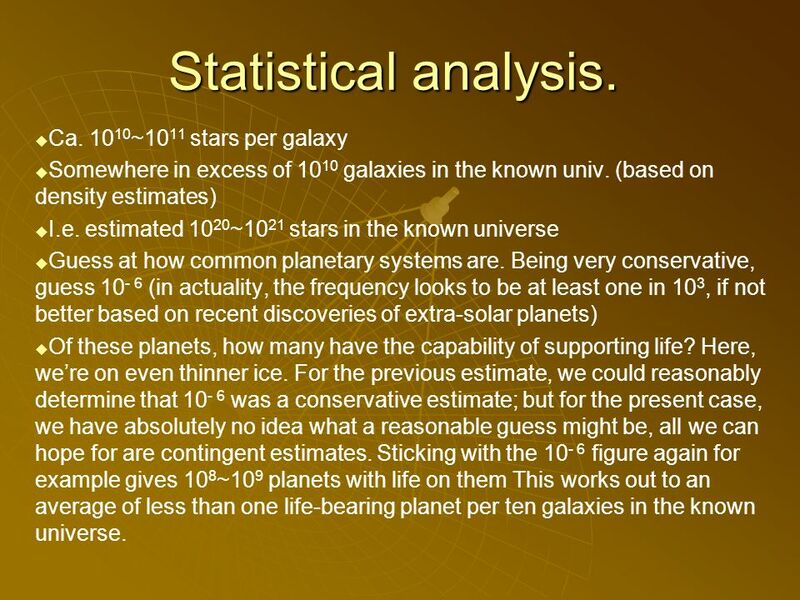 Sticking with the 10 - 6 figure again for example gives 10 8 ~10 9 planets with life on them This works out to an average of less than one life-bearing planet per ten galaxies in the known universe. 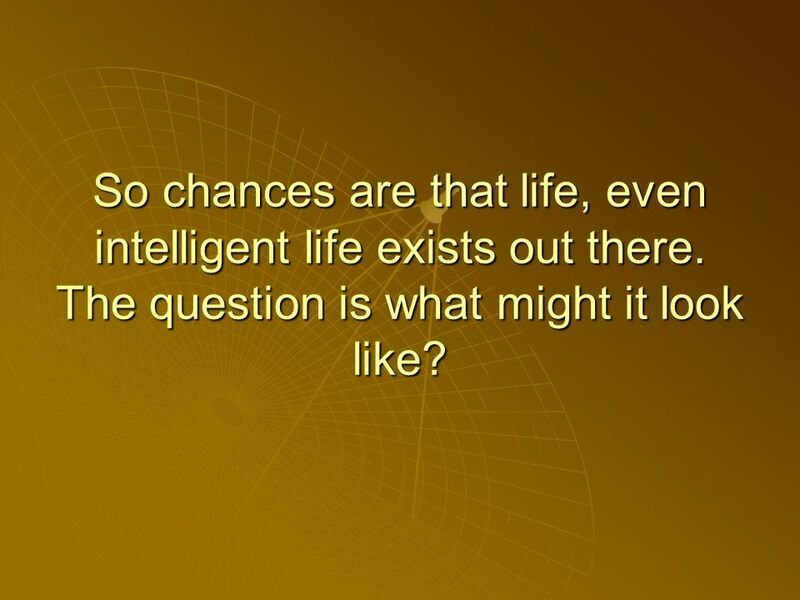 12 So chances are that life, even intelligent life exists out there. The question is what might it look like? 13 We now know enough about biology and several related fields (biochemistry, biophysics, etc.) 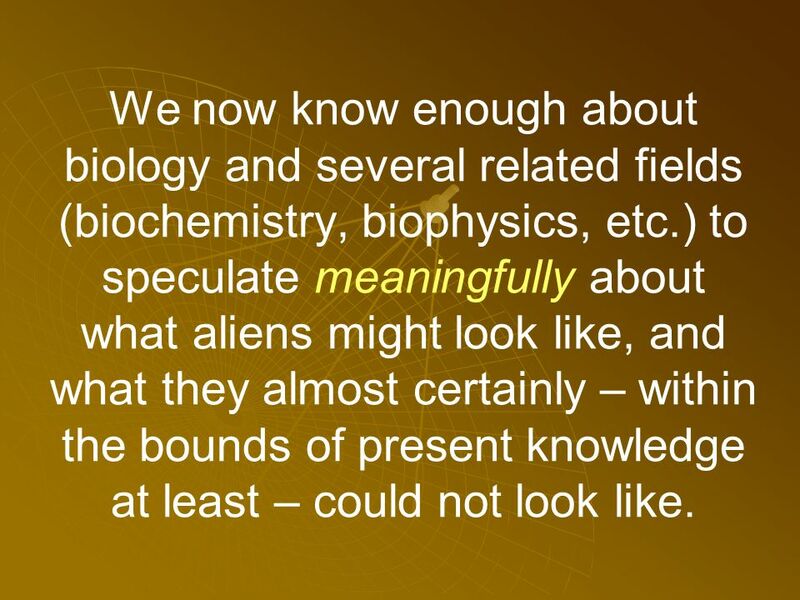 to speculate meaningfully about what aliens might look like, and what they almost certainly – within the bounds of present knowledge at least – could not look like. 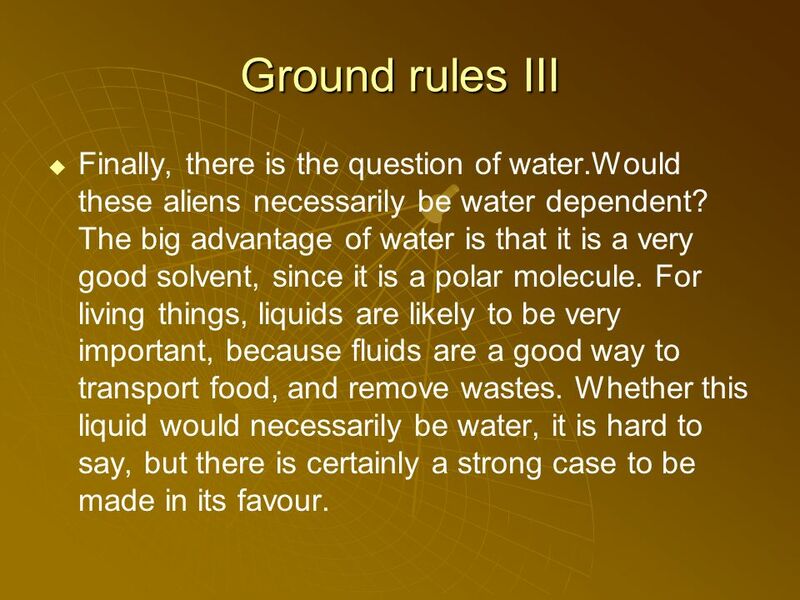 16 Ground rules III Finally, there is the question of water.Would these aliens necessarily be water dependent? The big advantage of water is that it is a very good solvent, since it is a polar molecule. For living things, liquids are likely to be very important, because fluids are a good way to transport food, and remove wastes. Whether this liquid would necessarily be water, it is hard to say, but there is certainly a strong case to be made in its favour. 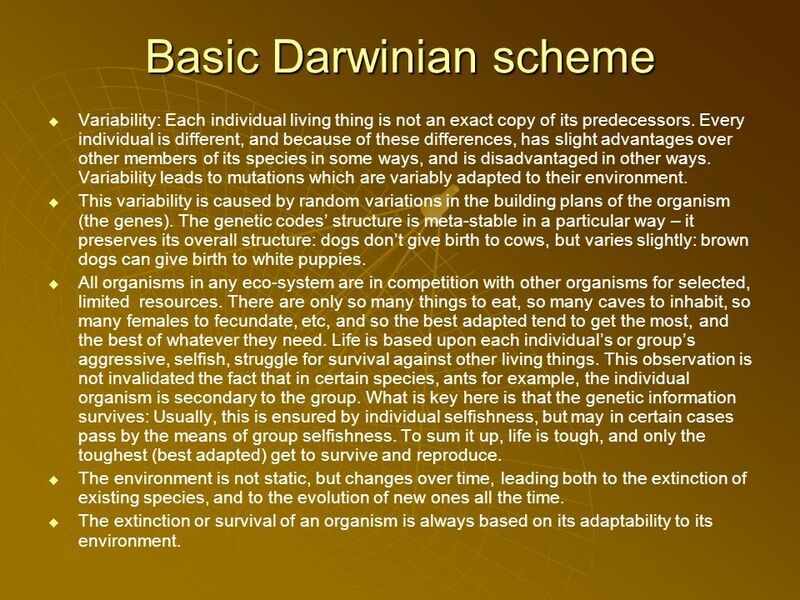 17 Basic Darwinian scheme Variability: Each individual living thing is not an exact copy of its predecessors. Every individual is different, and because of these differences, has slight advantages over other members of its species in some ways, and is disadvantaged in other ways. Variability leads to mutations which are variably adapted to their environment. This variability is caused by random variations in the building plans of the organism (the genes). The genetic codes structure is meta-stable in a particular way – it preserves its overall structure: dogs dont give birth to cows, but varies slightly: brown dogs can give birth to white puppies. All organisms in any eco-system are in competition with other organisms for selected, limited resources. There are only so many things to eat, so many caves to inhabit, so many females to fecundate, etc, and so the best adapted tend to get the most, and the best of whatever they need. Life is based upon each individuals or groups aggressive, selfish, struggle for survival against other living things. This observation is not invalidated the fact that in certain species, ants for example, the individual organism is secondary to the group. What is key here is that the genetic information survives: Usually, this is ensured by individual selfishness, but may in certain cases pass by the means of group selfishness. To sum it up, life is tough, and only the toughest (best adapted) get to survive and reproduce. The environment is not static, but changes over time, leading both to the extinction of existing species, and to the evolution of new ones all the time. The extinction or survival of an organism is always based on its adaptability to its environment. 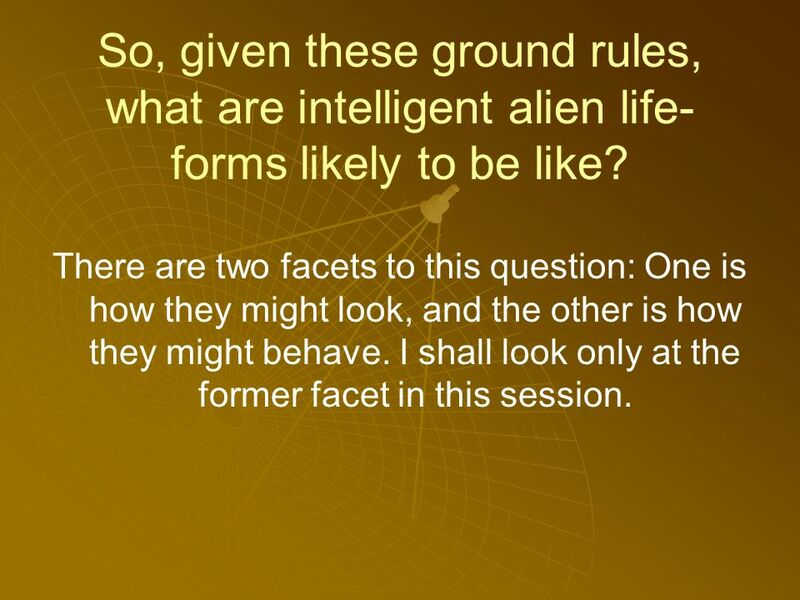 18 So, given these ground rules, what are intelligent alien life- forms likely to be like? There are two facets to this question: One is how they might look, and the other is how they might behave. I shall look only at the former facet in this session. 19 Lets start at the top. Would they necessarily have heads? Assuming that they would need to think, and that in order to think they would need thinking machinery – i.e. a nervous system of some sort – it is likely that the thinking would tend to be centralised simply because if the thinking part of the nervous system were to be diffuse, information processing would take much longer, and thought would not be as rapid as it could be. Thus, yes, I think it likely that they would have heads i.e. a location for the brain. Is it likely that their heads would be attached to one end of their bodies however I am unable to say. Assuming that they would need to think, and that in order to think they would need thinking machinery – i.e. a nervous system of some sort – it is likely that the thinking would tend to be centralised simply because if the thinking part of the nervous system were to be diffuse, information processing would take much longer, and thought would not be as rapid as it could be. Thus, yes, I think it likely that they would have heads i.e. a location for the brain. Is it likely that their heads would be attached to one end of their bodies however I am unable to say. On earth, it is true that most life-forms equipped with a central nervous system have it at one end of their bodies, This particular body-architecture evolved about 550 million years ago because it placed the information- processing circuitry close to the sensory organs, but whether this is a necessary condition of intelligent life or not, I cannot say. For radially symmetrical body-forms like octopuses a central location certainly makes more sense, but in the case of other body-forms I just dont know. 20 Skeletal structure Similarly, it is hard to say if they would absolutely have to have skeletons or not. 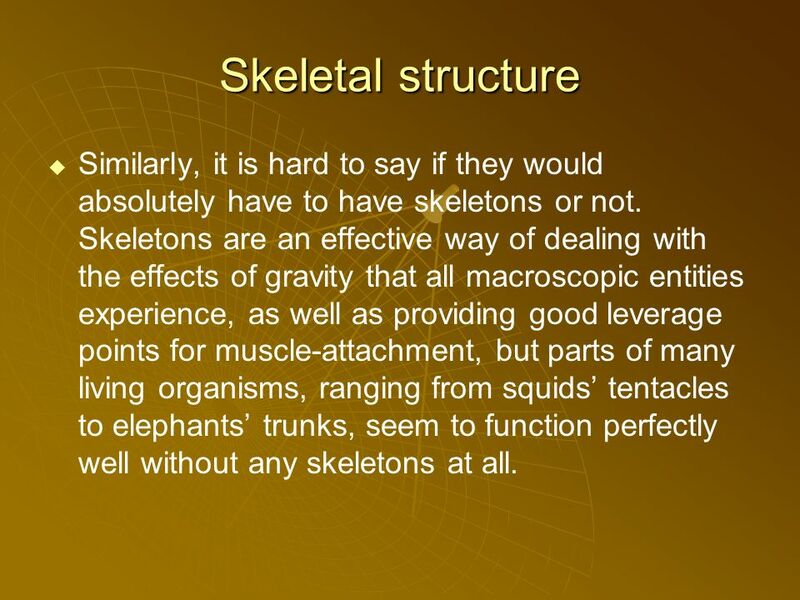 Skeletons are an effective way of dealing with the effects of gravity that all macroscopic entities experience, as well as providing good leverage points for muscle-attachment, but parts of many living organisms, ranging from squids tentacles to elephants trunks, seem to function perfectly well without any skeletons at all. 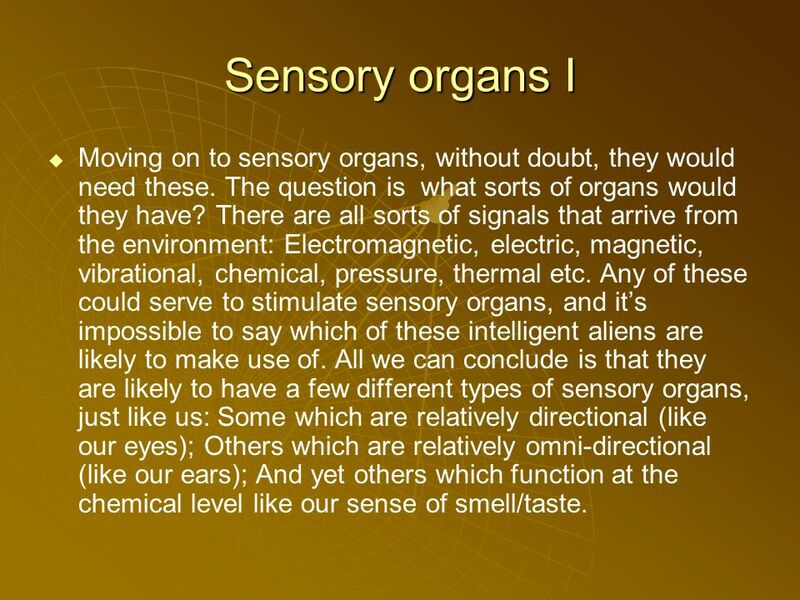 21 Sensory organs I Moving on to sensory organs, without doubt, they would need these. The question is what sorts of organs would they have? There are all sorts of signals that arrive from the environment: Electromagnetic, electric, magnetic, vibrational, chemical, pressure, thermal etc. Any of these could serve to stimulate sensory organs, and its impossible to say which of these intelligent aliens are likely to make use of. All we can conclude is that they are likely to have a few different types of sensory organs, just like us: Some which are relatively directional (like our eyes); Others which are relatively omni-directional (like our ears); And yet others which function at the chemical level like our sense of smell/taste. 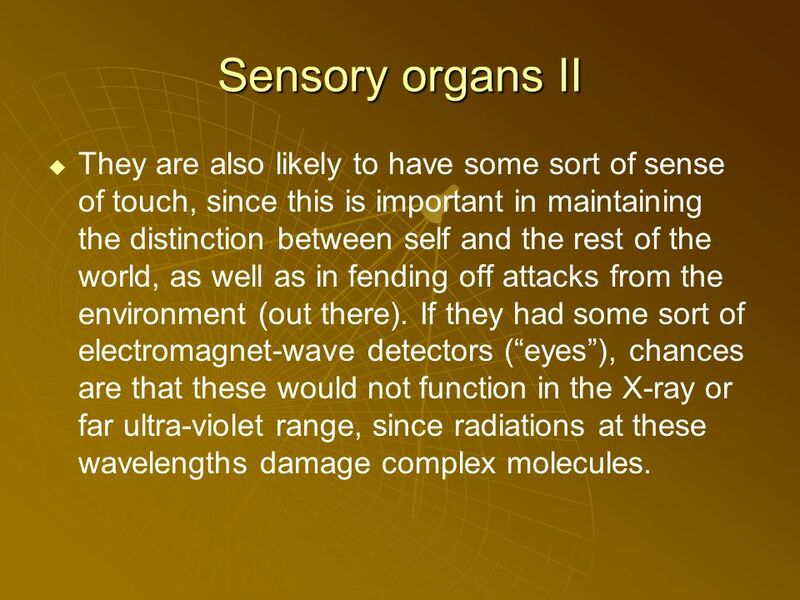 22 Sensory organs II They are also likely to have some sort of sense of touch, since this is important in maintaining the distinction between self and the rest of the world, as well as in fending off attacks from the environment (out there). If they had some sort of electromagnet-wave detectors (eyes), chances are that these would not function in the X-ray or far ultra-violet range, since radiations at these wavelengths damage complex molecules. 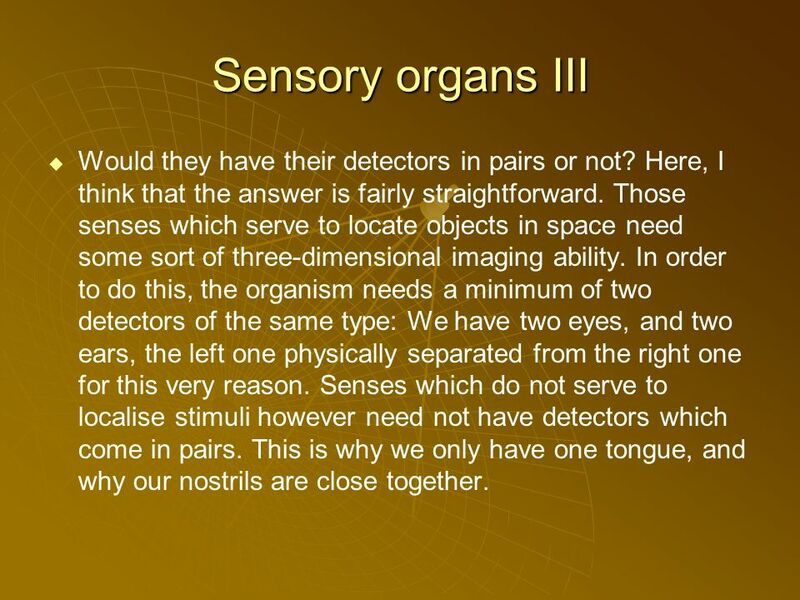 23 Sensory organs III Would they have their detectors in pairs or not? Here, I think that the answer is fairly straightforward. Those senses which serve to locate objects in space need some sort of three-dimensional imaging ability. In order to do this, the organism needs a minimum of two detectors of the same type: We have two eyes, and two ears, the left one physically separated from the right one for this very reason. Senses which do not serve to localise stimuli however need not have detectors which come in pairs. This is why we only have one tongue, and why our nostrils are close together. 24 Sensory organs IV Would they have more than two eyes or ears? 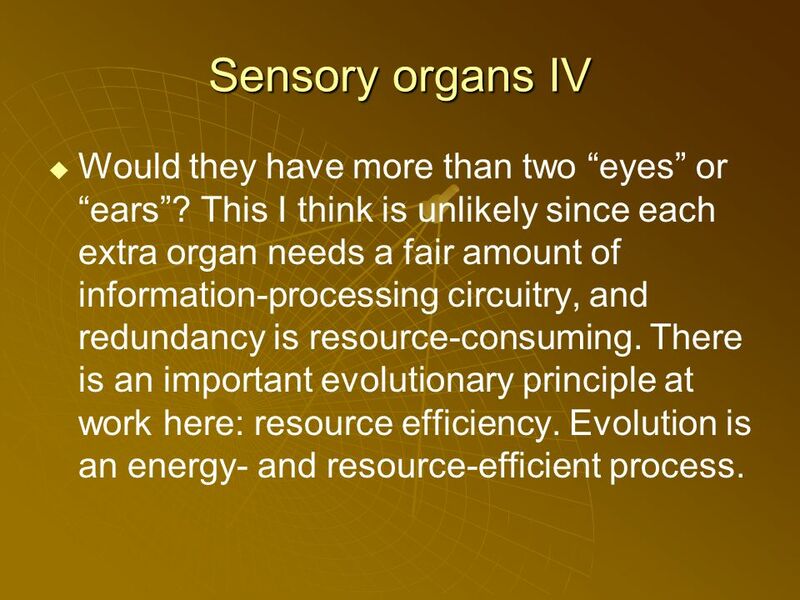 This I think is unlikely since each extra organ needs a fair amount of information-processing circuitry, and redundancy is resource-consuming. There is an important evolutionary principle at work here: resource efficiency. Evolution is an energy- and resource-efficient process. 25 Sensory organs V Would they have some of their sensory organs located as high up as possible (like us), or not? I think that this would depend on what type of sensory organs we were talking about. Sound and light detectors are normally most effective when they are placed high up, but other detectors might work better if they could moved either up to the top or close to the ground at will. An important caveat here is that distance from the CNS implies slower reaction times. This is why terrestrial animals have reflex loops. 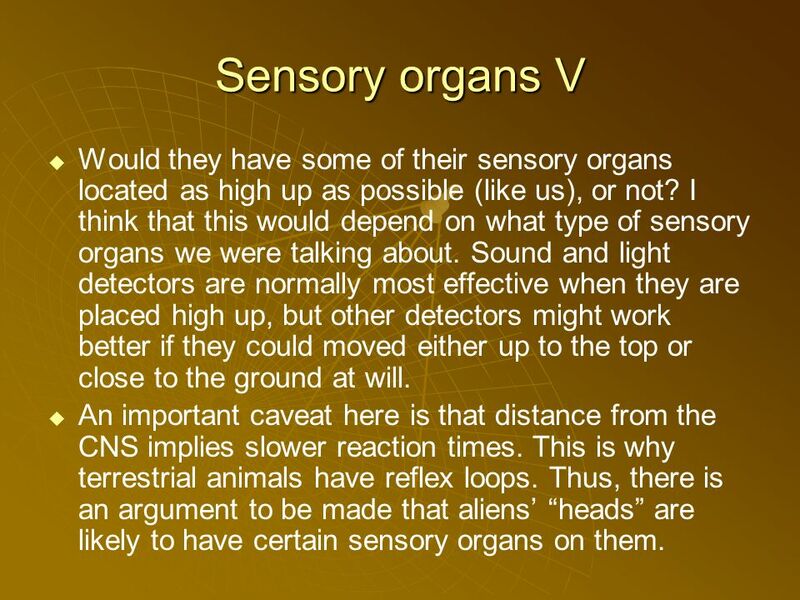 Thus, there is an argument to be made that aliens heads are likely to have certain sensory organs on them. 26 Land, air or sea? Would they be terrestrial? Again, whilst there is no definite answer possible, I think it likely, In order to be advanced, they would have needed to develop tool-making technology, and tool- making is likely to have remained rudimentary without the aid of fire, or some other heat-source of reasonable power, one hot enough to melt metals. This is more likely to have happened on land, than in a liquid (s.h.c. 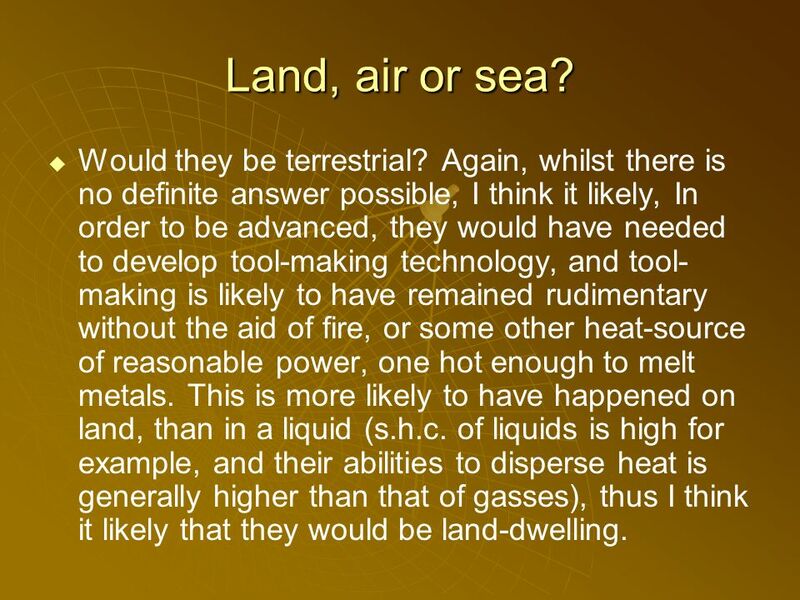 of liquids is high for example, and their abilities to disperse heat is generally higher than that of gasses), thus I think it likely that they would be land-dwelling. 27 Air, sea or land? You might be asking yourself, could they be avian? 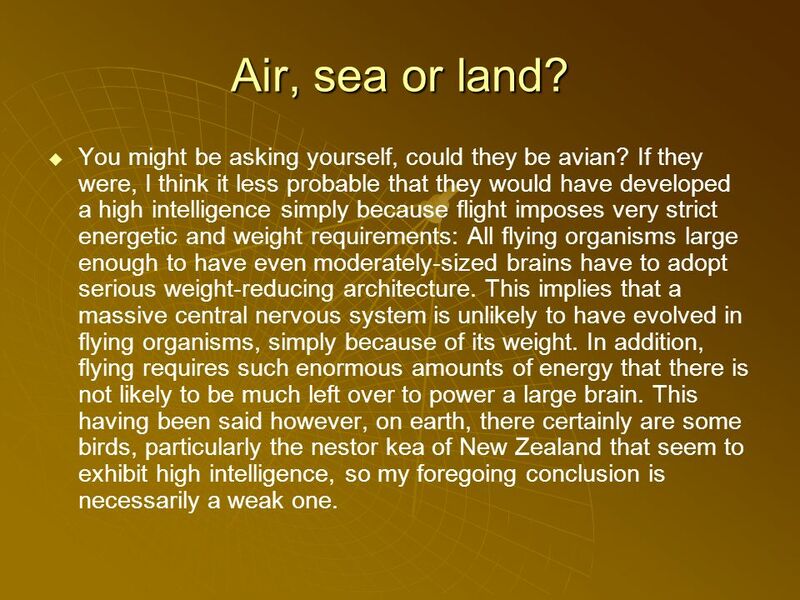 If they were, I think it less probable that they would have developed a high intelligence simply because flight imposes very strict energetic and weight requirements: All flying organisms large enough to have even moderately-sized brains have to adopt serious weight-reducing architecture. This implies that a massive central nervous system is unlikely to have evolved in flying organisms, simply because of its weight. In addition, flying requires such enormous amounts of energy that there is not likely to be much left over to power a large brain. This having been said however, on earth, there certainly are some birds, particularly the nestor kea of New Zealand that seem to exhibit high intelligence, so my foregoing conclusion is necessarily a weak one. 28 Sea, land or air? This is not to say that they might not have their roots in non-terrestrial forms. They could easily have evolved from fish-like ancestors (as we did), or bird-like ancestors, but are likely to be land-dwelling. Furthermore, they are likely to be surface dwelling,rather than subterranean, and living on a planet (like us), rather than on a meteor, or a star. 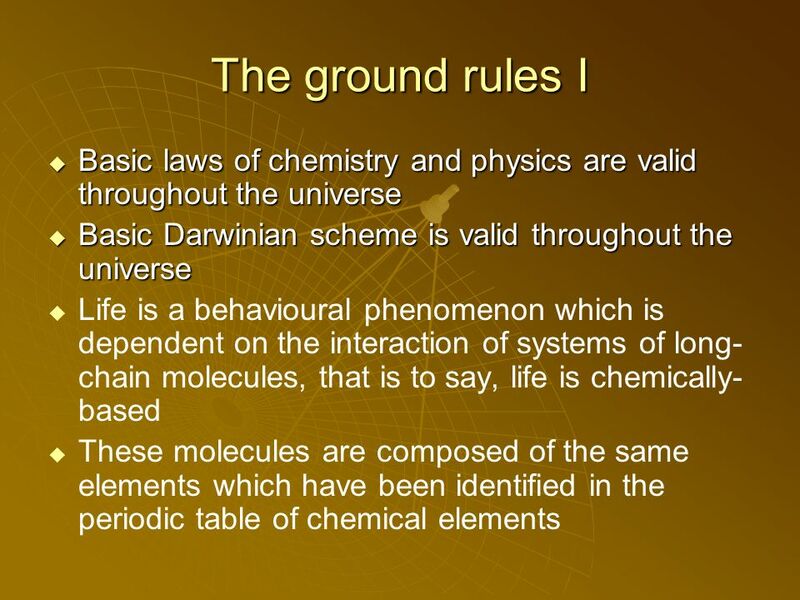 This is because the chemistry of life requires energy, and this energy is typically provided by a star (like our sun), around which life-bearing planets turn. 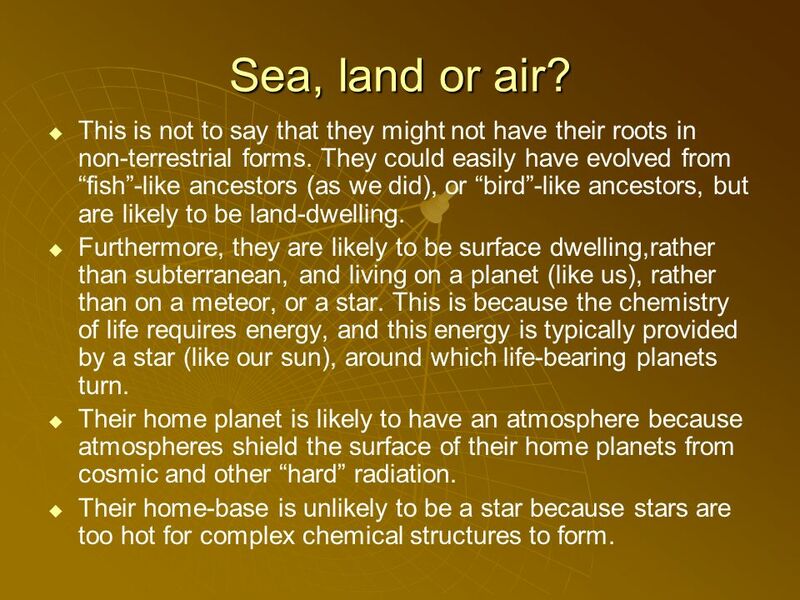 Their home planet is likely to have an atmosphere because atmospheres shield the surface of their home planets from cosmic and other hard radiation. Their home-base is unlikely to be a star because stars are too hot for complex chemical structures to form. 29 Could they shake hands? Could they do the twist? 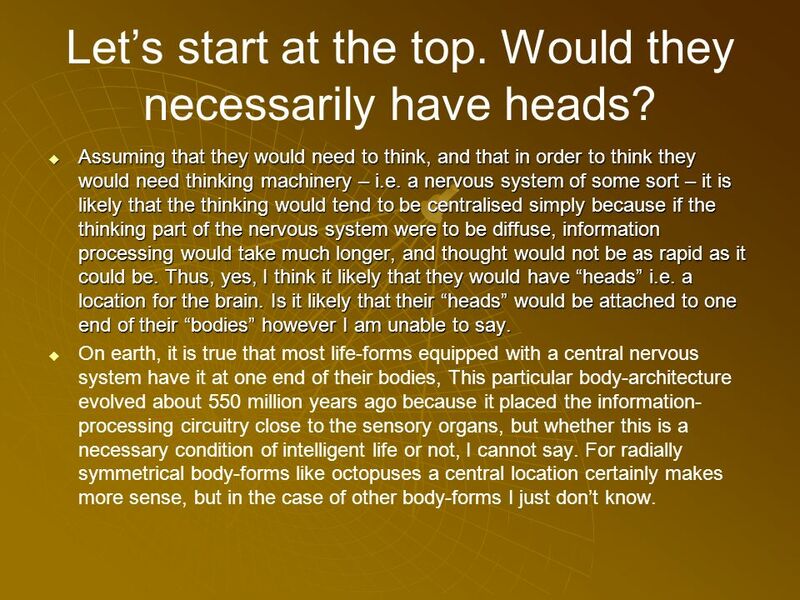 So, if they are most likely terrestrial, how many arms and legs are they likely to have? I put it to you that an intelligent, advanced life-form must have hands of some sort, instruments with which to manipulate the world. In order to direct these hands, a certain amount of brain-power is required, a certain number of neural circuits. Furthermore, the more complex the manipulative possibilities of these hands, the more neuronal processing capacity they will require (cf. the anatomy of the brain along the rift). 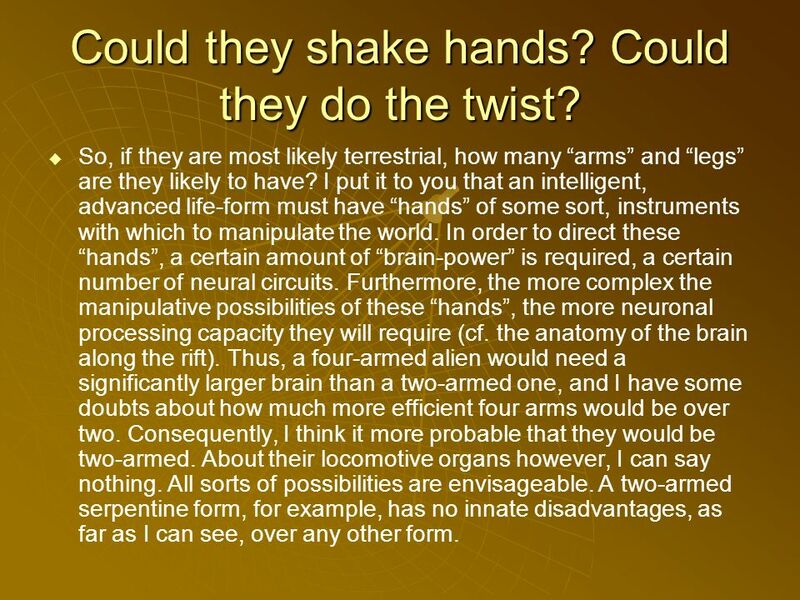 Thus, a four-armed alien would need a significantly larger brain than a two-armed one, and I have some doubts about how much more efficient four arms would be over two. Consequently, I think it more probable that they would be two-armed. About their locomotive organs however, I can say nothing. All sorts of possibilities are envisageable. A two-armed serpentine form, for example, has no innate disadvantages, as far as I can see, over any other form. 30 Could they sit on your couch? How big (or small) would they be? 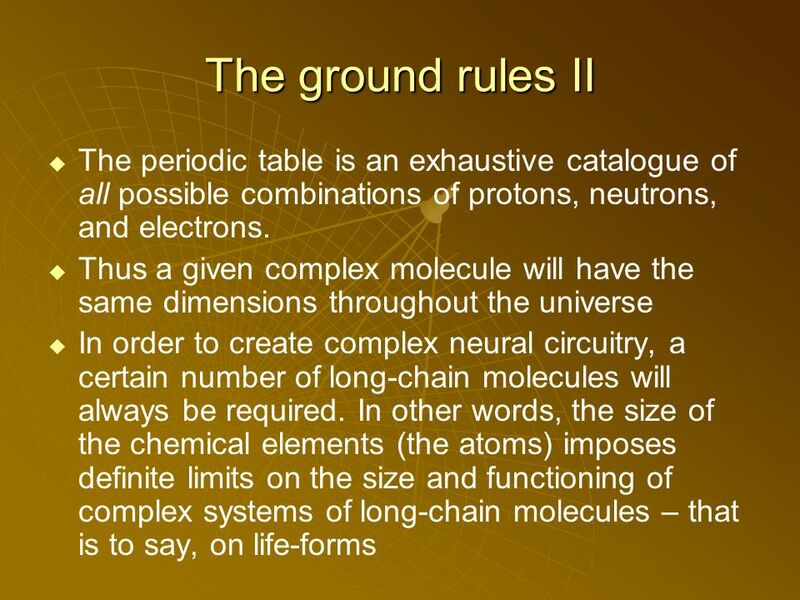 Again, we need to return to the premise that a certain minimum number of molecules, composed of the elements of the periodic table, are required in order to construct the machinery of a living organism, and of its brain. As far as we know, only carbon and silicon are capable of forming long-chain molecules of the type that I think are necessary for life. 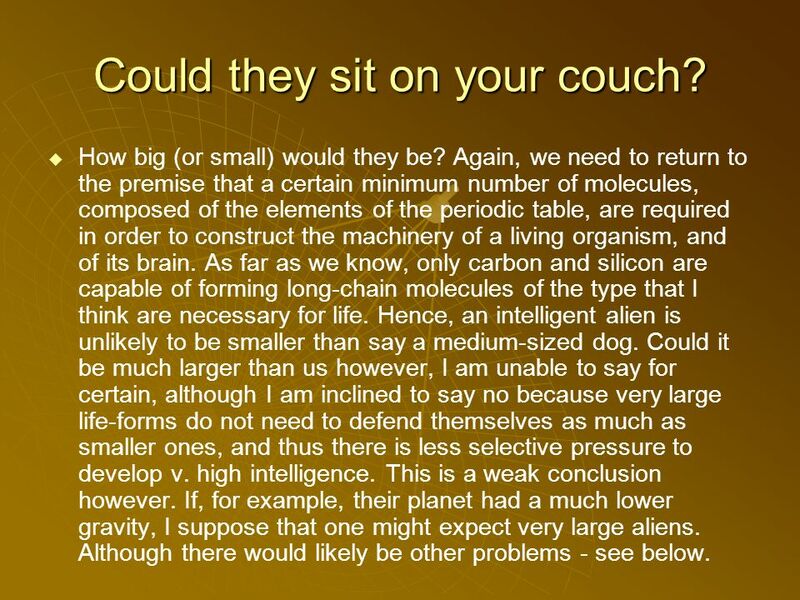 Hence, an intelligent alien is unlikely to be smaller than say a medium-sized dog. Could it be much larger than us however, I am unable to say for certain, although I am inclined to say no because very large life-forms do not need to defend themselves as much as smaller ones, and thus there is less selective pressure to develop v. high intelligence. This is a weak conclusion however. If, for example, their planet had a much lower gravity, I suppose that one might expect very large aliens. Although there would likely be other problems - see below. 31 Would they break your couch if they were to sit on it? There are problems with the idea of a very-low gravity planet producing (presumably) v. large intelligent life-forms. 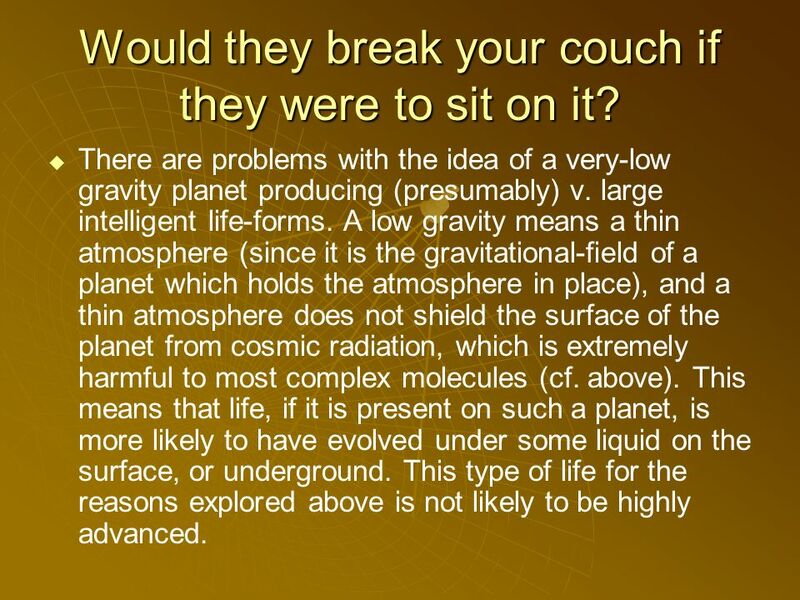 A low gravity means a thin atmosphere (since it is the gravitational-field of a planet which holds the atmosphere in place), and a thin atmosphere does not shield the surface of the planet from cosmic radiation, which is extremely harmful to most complex molecules (cf. above). This means that life, if it is present on such a planet, is more likely to have evolved under some liquid on the surface, or underground. This type of life for the reasons explored above is not likely to be highly advanced. 32 A question of energy? Occasionally, exobiologists have proposed that life might evolve on cold, low-gravity planets situated far from their parent star. 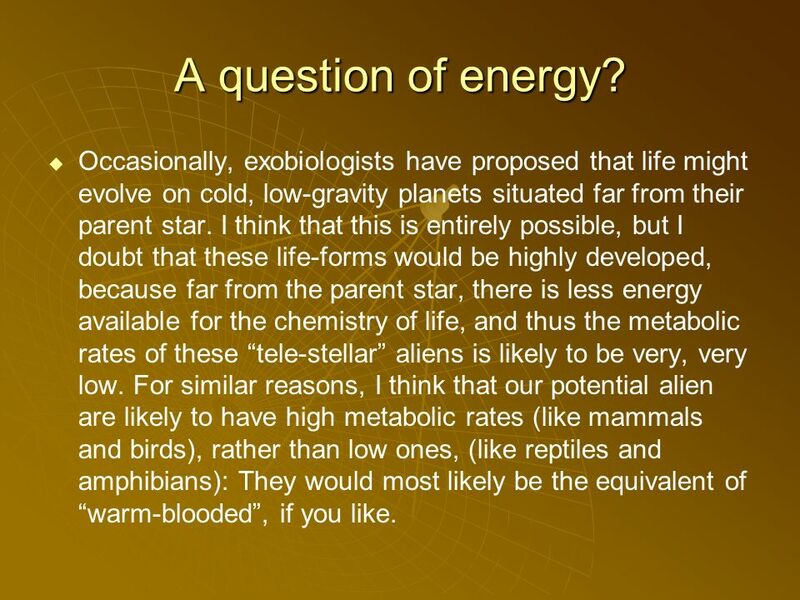 I think that this is entirely possible, but I doubt that these life-forms would be highly developed, because far from the parent star, there is less energy available for the chemistry of life, and thus the metabolic rates of these tele-stellar aliens is likely to be very, very low. For similar reasons, I think that our potential alien are likely to have high metabolic rates (like mammals and birds), rather than low ones, (like reptiles and amphibians): They would most likely be the equivalent of warm-blooded, if you like. 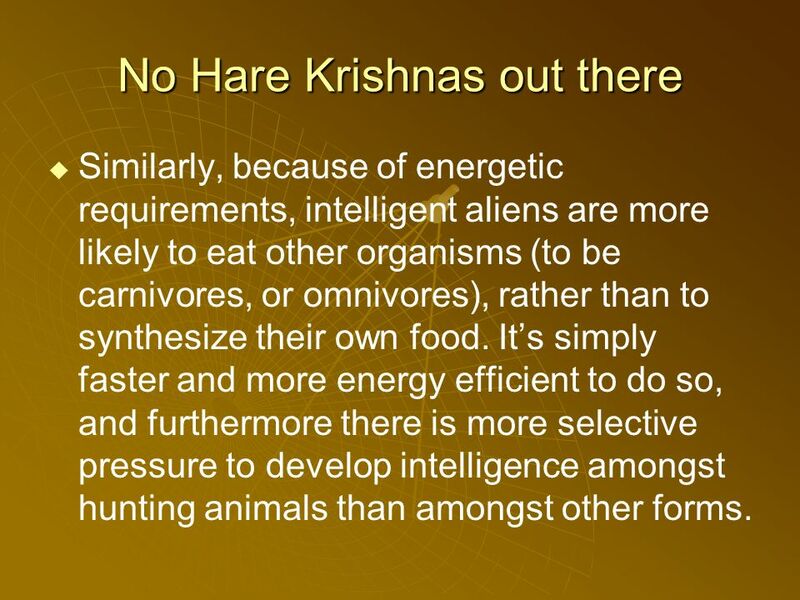 33 No Hare Krishnas out there Similarly, because of energetic requirements, intelligent aliens are more likely to eat other organisms (to be carnivores, or omnivores), rather than to synthesize their own food. Its simply faster and more energy efficient to do so, and furthermore there is more selective pressure to develop intelligence amongst hunting animals than amongst other forms. 34 Alien orgies Finally, are they likely to have developed sexual reproduction? 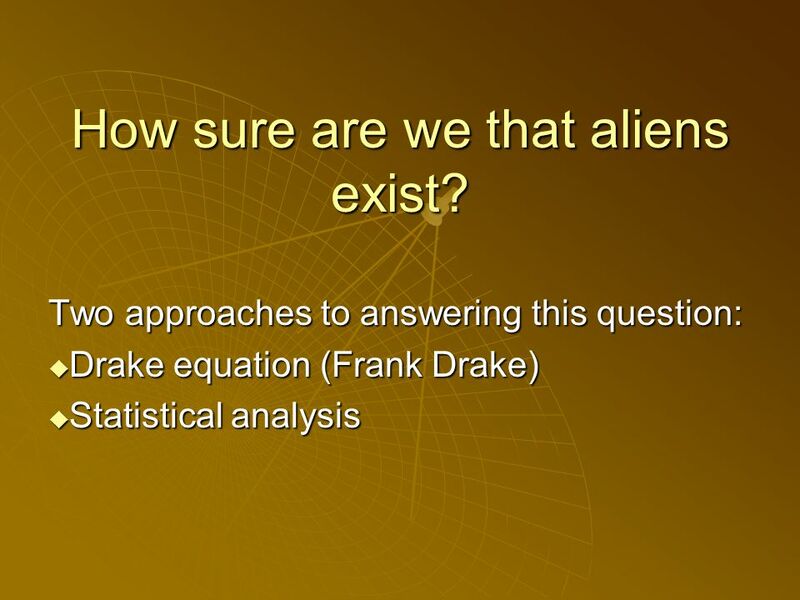 Alien abduction scenarios notwithstanding, the answer is a weak yes. Sexual reproduction introduces more variability into the gene pool than does asexual reproduction, and is, I think, in certain way favoured by the forces of evolution, at least in so far as complex intelligent organisms are concerned. Whether there would be two, three, or more partners involved however, I cannot say, and shall leave the answer to this question up to your fervid imagination. 35 ET phone home? 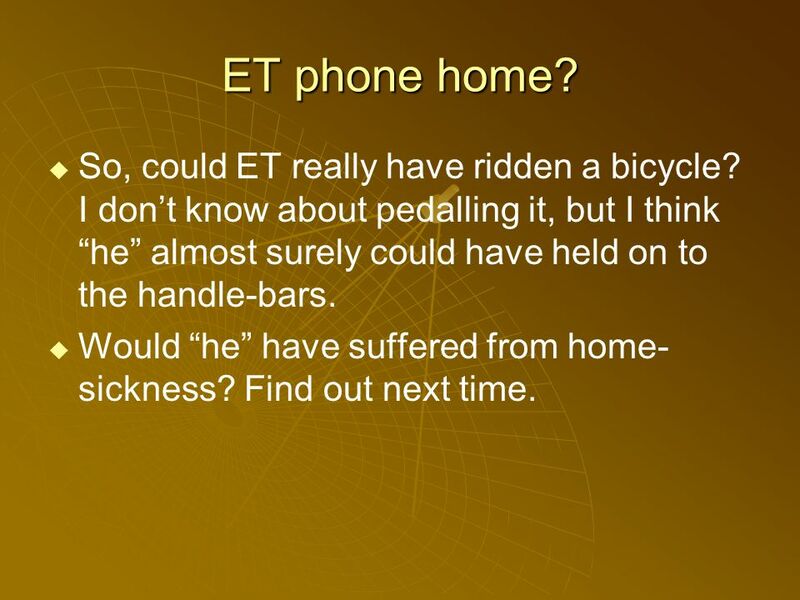 So, could ET really have ridden a bicycle? I dont know about pedalling it, but I think he almost surely could have held on to the handle-bars. Would he have suffered from home- sickness? Find out next time. 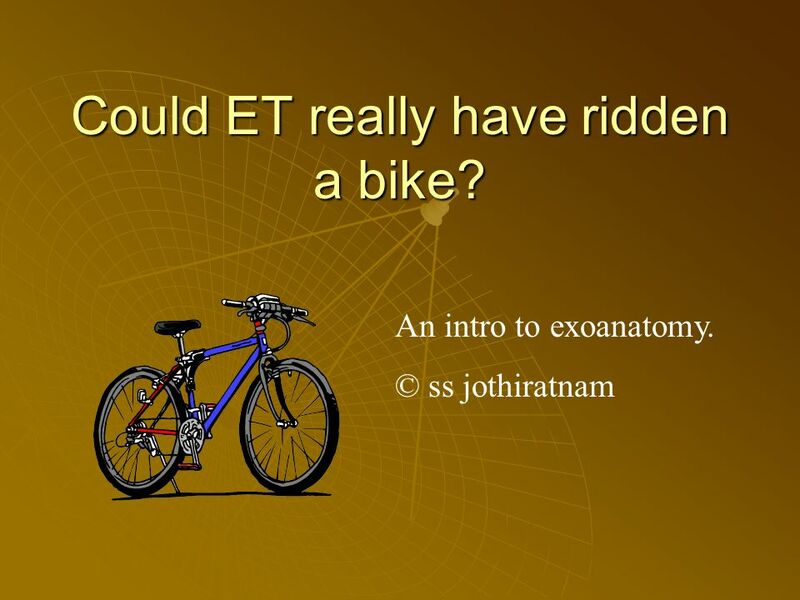 Download ppt "Could ET really have ridden a bike? 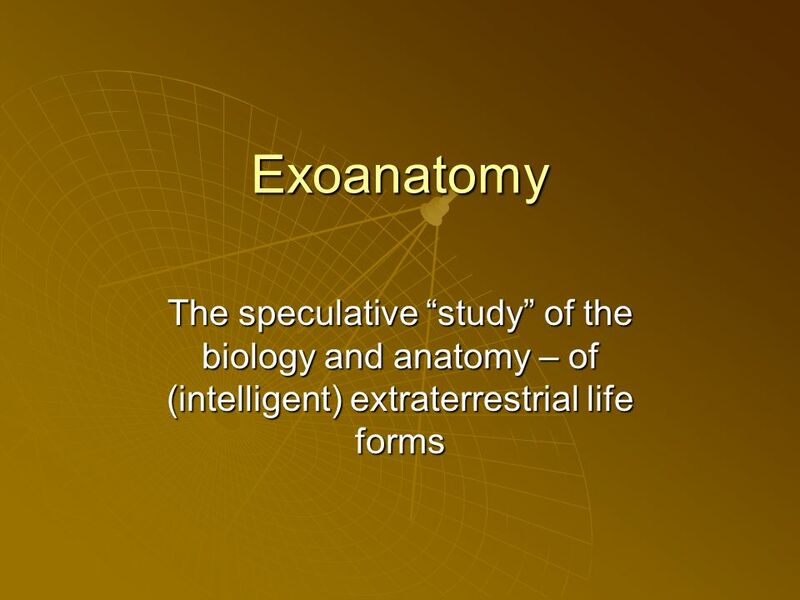 An intro to exoanatomy. © ss jothiratnam." Work Work: Work is said to be done when the point of application of a force moves and it is measured using the product of force and the distance moved. Energy Energy: Energy is the capacity of a body to do work. Presentation by: Heather DeRoy. Discovery of New Planet! Planet Earth, a part of a Solar System, is a possible candidate for life. Cosmology The Origin and Future of the Universe Part 2 From the Big Bang to Today. Question The theory which resolves both the horizon and flatness problems is called: A) Decoupling B) Relativity C) Inflation D) Big Bang. Design Arguments. Arguments for theism Ontological arguments Cosmological arguments Design arguments. Introduction to Thermodynamics Unit 03 - Thermodynamics. Extra-terrestrial Civilizations. Are we alone? Contact … Direct contact through traveling to the stars and their planets Will be a challenge because of.